To manage your documents easier you can set up document categories. Categories are like folders, where you can add certain documents to have them distinguished from the others. You can later on filter your documents by the category they belong to or if your role is owner or company administrator, share this category in organisation or add company users that would be automatically invited to sign or review the documents in that category. 1. Log in to the portal, click the "Settings" button - gear icon, that is located at the top of the right side of the screen, or click on your name for the drop-down menu to appear and click "Settings". 2. Open the tab "Document categories". 3. Click the "Create new category" button. 4. 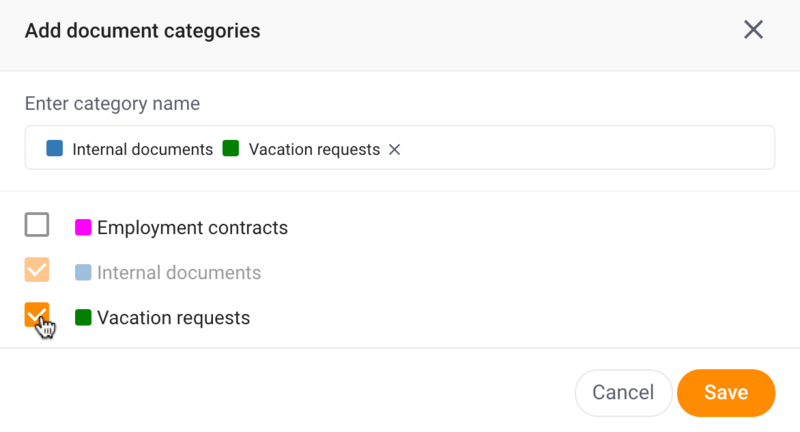 In the "Settings" section, enter the title of the category (you can also choose a colour) and if you are the company account owner or administrator choose whether you want it to be shared in company by toggling the button. Note: shared in company category means that all you company users will be able to add their documents to this category. It does not mean that they will be able to see all the documents in this category. 5. In the "Users" section, you will be able to grant any of your company users various category management rights. Note: this section is only visible to company account owner or administrator. Click on the search bar or start entering user's name for the drop-down list of your company users to appear and select the user. User role - you can choose from "Has access", "Must sign" and "Must approve". "Has access" means that all documents added to this category will be visible to this person. "Must sign" means that all documents assigned to this category will be assigned to this person to sign. "Must approve" means that all documents assigned to this category will be assigned to this person to approve. Delete - by clicking the blue trash bin icon you will remove selected user from the category. "Require qualified electronic signatures" - documents in this category can only be signed with qualified electronic signatures, that have equivalent legal effect to handwritten signatures according to EU Regulation No 910/2014 (eIDAS). 8. In the "Integrations" section you can enter the URL where signed documents (in this document category) will be returned. 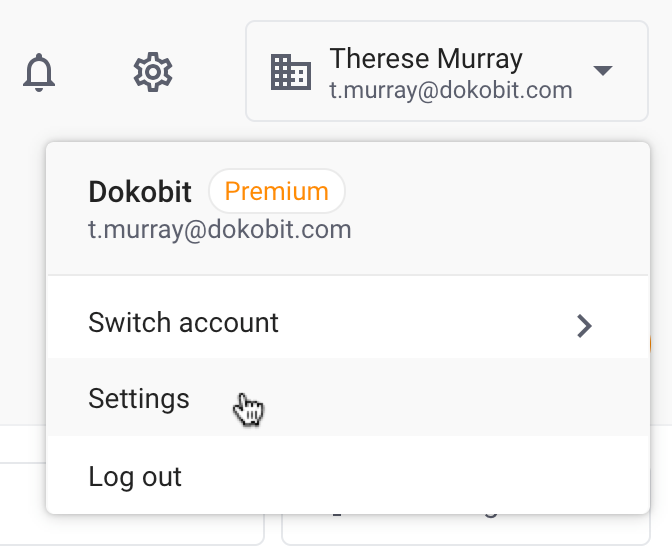 This functionality is available for Dokobit Portal API users. More information about Portal API solution can be found here. 9. To finish creating a document category click the "Create" button at the top of the right side of the window . 10. Follow the steps from 1 to 4 described at the beginning of this article. 11. From the "Parent category" drop-down list choose a category that will be higher than this subcategory you are creating. 12. Follow the steps from 5 to 8 to finish creating the category. 13. Subcategories let you create a category tree. 14. Open the tab "Document categories". 15. Click on the category you wish to edit from the created category list. 16. On the right side you can review category settings. 17. Click the "Actions" button and choose whether you want to edit or delete this category. 18. If you choose to delete a "Parent" category, all "Subcategories" will be deleted as well. Note: the documents will not be deleted. 19. If you choose to edit the category, finish the action by clicking the green "Save" button at the top of the right side of the window. 20. Locate section no. 4, called "Set Document Options" and click "Add category" button. 21. Choose a category by checking the box on the left side of it and click "Save". 22. If you choose a subcategory, parent category will be added to this document as well. 23. You can search a category by it's title by entering it in the designated area under "Enter category name". 24. If the category with entered title does not exist yet, you will be able to create a new category by clicking "Create". 25. You will then be able to set categories title, choose a parent category if necessary and choose whether the category is shared in company and whether it is required to sign documents with qualified electronic signature. 26. To finish creating the category, click the "Create" button. 27. Select a document you want to add to a document category from your document listing page. 28. Locate section no. 1, called "Information" and click the "Add category" button and follow the steps 21-26 described in this article.